Hello! It’s been a while since I shared a recipe. I’ve been trying to shake a lingering cold-thing for like, almost two weeks. I haven’t felt much like cooking. But! Last Saturday I made an apple strudel. We were having an Oktoberfest get-together that day. Also, I’m recommencing my German studies next week. Apple strudel was on-theme for the party AND my life. I started the apple strudel by making the dough. Once all of the dough ingredients (bread flour, water, vegetable oil, salt) are combined you have to knead it for fifteen minutes or until it is smooth. I don’t normally make things where kneading is part of the process, so this was new for me. I had to make a little work station in our living room because my roommates were busy making other things in the kitchen. 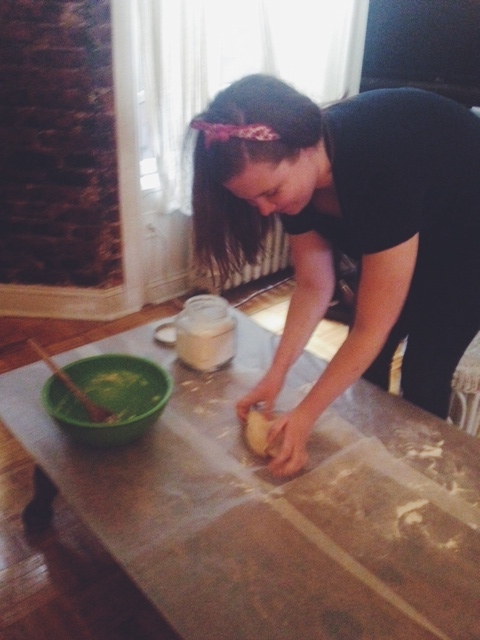 Kneading dough for fifteen minutes on a coffee table ain’t easy. 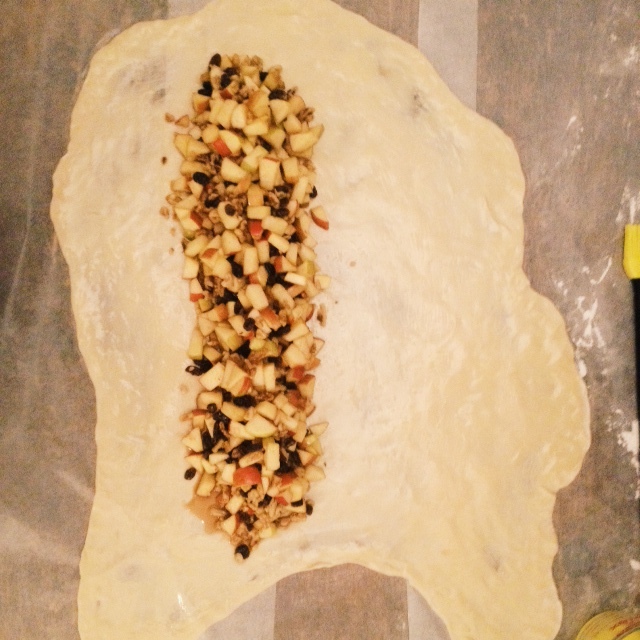 After that, I prepared the filling (apples, rum-soaked raisins, walnuts and sugar) while the dough rested. Not gonna like, every time I smell rum I think of throwing up into a trash can in my freshman dorm, so I kind of immediately regretted soaking the raisins in rum. But hey, I was following a recipe and that’s what it told me to do. Actually, it told me that I could also soak the raisins in water, Cognac or grappa and I went for the rum because I like to punish myself in small ways all the time. Then it was time to stretch out the dough! What I didn’t realize before I decided to make apple strudel was that you have to stretch the dough out until it’s very thin, into a 2×3 foot rectangle, place the filling on the dough and then, somehow, roll the whole thing up. It took me a really, really long time to get the dough stretched out to be long and wide enough to roll the filling up once. It tore in a few places, but that ended up not being a problem. 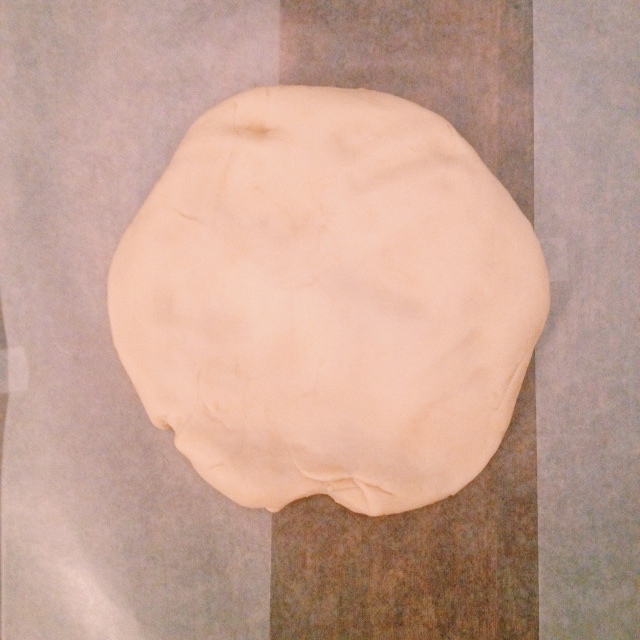 I brushed the dough with melted butter and arranged the filling in a line at one end. Then, I placed the strudel ingredients (sour cream, melted butter and bread crumbs) on top. I was nervous to roll it all up in the dough because it was kind of heavy, but my friend Becky helped me keep everything together. It ended up being so large that we had to lay it diagonally on a cookie sheet. The recipe said to bake the apple strudel for 60 minutes at 350. I ended up baking it for a little under 60 minutes and I thought it was probably overdone. Anyway, I will probably make something with pumpkin next because…fall. Suggestions? Please send some. 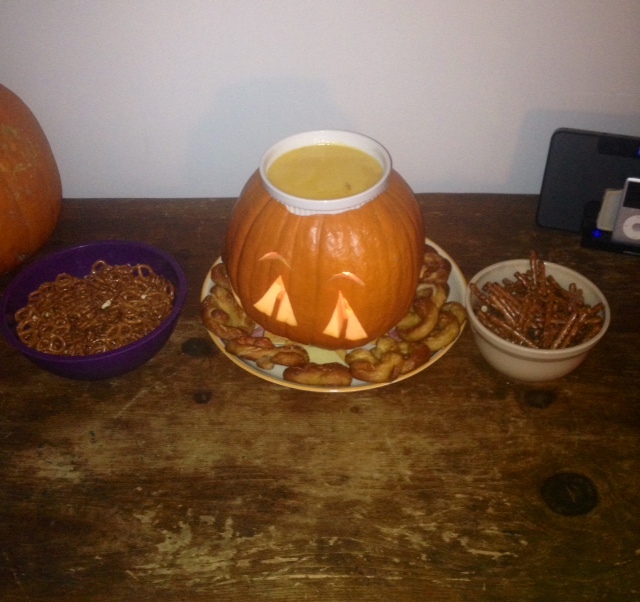 Been thinking about Ina Garten’s Pumpkin Banana Mousse Tart but I could be persuaded to do something else.